Sales Manager Fail: Why Do You Keep Missing Quota? We've all heard the corporate jargon "Management By Objectives," a classic framework that C-Level execs use for their leadership team. This system keeps the boardroom focused on what Franklin Covey would call "the rocks" of the business. I as a CEO use MBO's for our senior leaders of each business unit. But, if you're not a manager of managers, but a manager of individual sales professionals (known as frontline sales manager) DO NOT apply the MBO practice towards coaching your reps and hitting your sales goals. This practise will only be a major detriment to your coaching system. Instead, you want to learn management by activity… that influences the Objective. 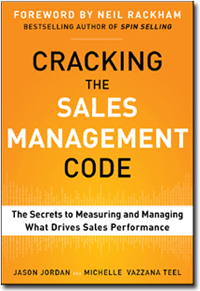 If you're unfamiliar with this concept, pick up Jason Jordan’s book Cracking the Sales Management Code. Latest research shows only 54.6% of sales professionals hit their quota. While there’s an endless number of reasons for this, sales managers can start affecting change today in the activities they coach by. When you catch early warning signs for not hitting quota, you have a much better chance of diagnosing the problem and steering that month’s quota back on track. Let me place these two management styles in an analogy. We'll use high school graduation – place the teacher (as you), and students (as sales reps) and succeeding towards university (as hitting sales quota). As the teacher, you've been given one overarching outcome to achieve, which is to get 100% of these students to graduate and go to university. As an objective, you want to ensure that each student does well on their assignments, tests and final exam to reach those goals. Every month (like a sales quota) you the teacher hands out a pop quiz. After grading their tests, you pull the failing students into your office and review why these students didn't hit their objective, and what they can do better on the next pop quiz. Unfortunately you’re surprised when the same repeat offenders fail the next month’s objectives. Why? Because you’re saying to your students “just get better,” but the students clearly don’t understand the details, actions, activities necessary to better prepare for the test. Without an action roadmap, how can you possibly ask your students to magically get better? The other major failure is that objectives are a form of lagging indicators. The students have ALREADY failed the test! It’s like not hitting last month's quota. There is nothing you can do about this. You need to attack the problems BEFORE the test (attack sales quota alignment BEFORE month’s end). A great teacher will look for early warning signs, early indicators, any signs that we’re going to influence meeting an objective. Great teachers will watch who sits in the front of the class, pays attention, and can demonstrate learning to action in the live class. They’ll also watch those who are struggling with these early warning signs and pay more attention to them too. You as the teacher will ensure days before the test, each student has aligned their knowledge to doing well on the test. The test is like a monthly or quarterly objective… your students do well on each month’s tests, and they’re highly likely to do really well on the exam. Concentrate on what you can control… ACTIVITY. Watch the team daily and weekly against these key activities, and make sure they’re doing the necessary actions to give you a fighting chance to hit your objectives. Don’t think the way your CEO manages (MBO’s) will work for you! The CEO doesn’t care about day-to-day activity, but you should.